Hermes Trismegistus (Greek for "Hermes the thrice-greatest" or Mercurius ter Maximus in Latin, is the syncretism of the Greek god Hermes and the Egyptian Thoth. In Hellenistic Egypt, the god Hermes was given as epithet the Greek name of Thoth. He has also been identified with Enoch. Other similar syncretized gods include Serapis and Hermanubis. 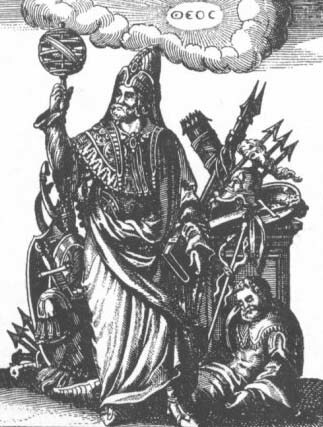 Hermes Trismegistus might also be explained in Euhemerist fashion as a man who was the son of the god, and in the Kabbalistic tradition that was inherited by the Renaissance, it could be imagined that such a personage had been contemporary with Moses, communicating to a line of adepts a parallel wisdom. A historian, however, would leave such speculation to the history of alchemy and the nineteenth-century history of occultism. Both Thoth and Hermes were gods of writing and of magic in their respective cultures. Thus the Greek god of interpretive communication was combined with the Egyptian god of wisdom as a patron of astrology and alchemy. In addition, both gods were psychopomps, guiding souls to the afterlife. The majority of Greeks, and later Romans, did not accept Hermes Trismegistus in the place of Hermes. The two gods remained distinct from one another. The Hermetic literature added to the Egyptian concerns with conjuring spirits and animating statues that inform the oldest texts, Hellenistic writings of Greco-Babylonian astrology and the newly developed practice of alchemy. In a parallel tradition, Hermetic philosophy rationalized and systematized religious cult practices and offered the adept a method of personal ascension from the constraints of physical being, which has led to confusion of Hermeticism with Gnosticism, which was developing contemporaneously Dan Merkur, "Stages of Ascension in Hermetic Rebirth". As a divine fountain of writing, Hermes Trismegistus was credited with tens of thousands of writings of high standing, reputed to be of immense antiquity. Plato's Timaeus and Critias state that in the temple of Neith at Sais, there were secret halls containing historical records which had been kept for 9,000 years. Clement of Alexandria was under the impression that the Egyptians had forty-two sacred writings by Hermes, encapsulating all the training of Egyptian priests. Siegfried Morenz has suggested (Egyptian Religion) "The reference to Thoth's authorship...is based on ancient tradition; the figure forty-two probably stems from the number of Egyptian nomes, and thus conveys the notion of completeness." The Neo-Platonic writers took up Clement's "forty-two essential texts". The so-called "Hermetic literature", the Hermetica, is a category of papyri containing spells and induction procedures. In the dialogue called the Asclepius (after the Greek god of healing) the art of imprisoning the souls of demons or of angels in statues with the help of herbs, gems and odors, is described, such that the statue could speak and prophesy. In other papyri, there are other recipes for constructing such images and animating them, such as when images are to be fashioned hollow so as to enclose a magic name inscribed on gold leaf. 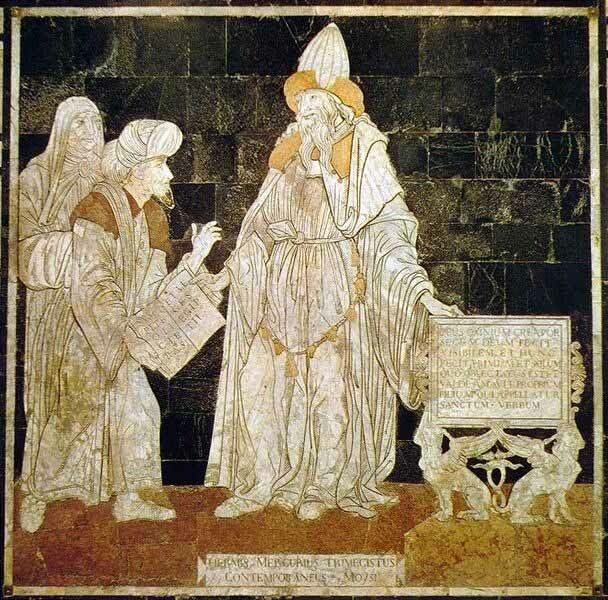 During the Middle Ages and the Renaissance, the writings attributed to Hermes Trismegistus known as Hermetica enjoyed great credit and were popular among alchemists. The "hermetic tradition" therefore refers to alchemy, magic, astrology and related subjects. The texts are usually distinguished in two categories the "philosophical" and "technical" hermetica. The former deals mainly with issues of philosophy, and the latter with magic, potions and alchemy. Among other things there are spells to magically protect objects, hence the origin of the term "Hermetically sealed". The classical scholar Isaac Casaubon in De Rebus sacris et ecclesiaticis exercitiones XVI (1614) showed, by the character of the Greek, the texts that were traditionally written at the dawn of time, to be more recent: most of the "philosophical" Corpus Hermeticum can be dated to around AD 300. However, flaws in this identification were uncovered by the 17th century scholar Ralph Cudworth, who argued that Casaubon's allegation of forgery could only be applied to three of the seventeen treatises contained within the Corpus Hermeticum. Moreover, Cudworth noted Casaubon's failure to acknowledge the codification of these treatises as a late formulation of a pre-existing (possibly oral) tradition. According to Cudworth, the text must be viewed as a terminus ad quem and not a quo. Modern occultists continue to suggest that some of these texts may be of Pharaonic origin, and that "the forty two essential texts" that contained the core work of his religious beliefs and his life philosophy remain hidden away in a secret library. The adventures of hermes in his various roles throughout history, linked with Ancient Alien Theory. Edgar Cayce mentioned Hermes or Thoth as an engineer in Atlantis who later built, designed, or directed the construction of the Pyramids of Egypt.